FEMA released the refreshed National Incident Management System (NIMS) for a 30-day national engagement period. National engagement provides an opportunity for interested parties to comment on the draft NIMS, so that it reflects the collective expertise and experience of the entire community. This national engagement period will conclude at 5:00 pm EDT on May 9, 2016. FEMA is hosting a series of 60-minute webinars to highlight proposed changes to the NIMS, provide information on submitting feedback and answer participant questions. All webinars are open to the individuals and communities from the private and nonprofit sectors, faith-based organizations and all levels of governments. Advance registration is required and on a first-come, first-served basis. Select your preferred webinar session from the list provided here. If you require accommodations to participate, please provide details in the Disability Related Accommodations field on the registration page or contact: FEMA-NIMS@fema.dhs.gov. Comments made during the webinars are for discussion purposes only. FEMA will only formally adjudicate comments submitted using the feedback form. To provide input, download the draft NIMS and feedback matrix from the link above and submit the completed feedback form to FEMA-NIMS@fema.dhs.gov. FEMA's Emergency Management Institute (EMI) Virtual Tabletop Exercise (VTTX) program will offer an aircraft crash scenario May 24, 25, and 26, 2016. The VTTX was designed to help communities specifically look at an aircraft crash taking place in their community, using historical events and recovery actions. The VTTX involves key personnel discussing simulated scenarios in an informal setting and can be used to assess plans, policies, training, and procedures. EMI conducts a monthly series of VTTXs using a Video Teleconference (VTC) platform to reach community-based training audiences around the country providing a virtual forum for disaster training. The design of the VTTX is for a group of ten or more representatives from state, local, tribal and territorial emergency communities of practice. Participants will need to connect via a site equipped with the appropriate VTC capability, but alternate ways to participate are also available upon request. The goals of the VTTX are to test the participants’ knowledge, skills, and abilities to conduct all-hazards emergency response and recovery effectively. The VTTXs also enable coordination of response operations with counterparts from Federal agencies, state, local, tribal and territorial governments, private sector organizations, non-governmental agencies, and other whole community partners. The VTTX occurs 12:00 p.m. – 4 p.m. EDT. To participate in a VTTX, submit an email request to Doug Kahn at douglas.kahn@fema.dhs.gov or call 301-447-7645. Please send a courtesy copy email to the Integrated Emergency Management Branch at fema-emi-iemb@fema.dhs.gov or call 301-447-1381. The deadline for applying to a VTTX is April 26. Session content is the same each day and participants only need to attend one session. Additional information is available at https://training.fema.gov/programs/emivttx.aspx. Logistics stakeholders will gather at FEMA Headquarters in Washington, D.C. on April 27 to review critical planning for the 2016 Atlantic hurricane season. The meeting is part of the annual ESF-7 Logistics Hurricane Concept of Resource Support Briefing hosted by FEMA’s Logistics Management Directorate and the General Services Administration. The meeting will be attended by state, local, tribal, territorial, regional, federal and private-sector partners, and organizations that will review their resource support preparedness for potential hurricanes and typhoons. They will discuss resource support levels for hurricane and typhoon response; and ongoing ESF-7 hurricane preparedness initiatives. For information on how to participate contact Dana Thorpe at dana.thorpe@fema.dhs.gov. Americans have been moving from awareness into action to prepare for disasters with America’s PrepareAthon!, a grassroots, community-based campaign to create a more prepared nation. On April 30, National PrepareAthon! Day encourages all Americans to know what to do when a disaster occurs, to get involved and to get prepared now and throughout the year. For six weeks this spring, America’s PrepareAthon! and other preparedness partners including the National Weather Service and Ready campaign will focus on various hazards and provide simple actions that people and communities should take to prepare for each particular hazard. This second week highlights tornadoes. Individuals, communities, businesses, schools, and houses of worship around the country are holding preparedness discussions, conducting drills, and taking specific steps to prepare for tornadoes and other disasters. 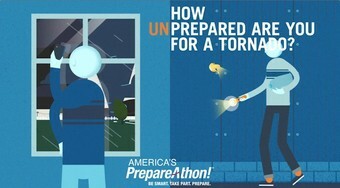 Watch America’s PrepareAthon!’s short animated video on tornado preparedness showing what you need to do to prepare for a tornado. 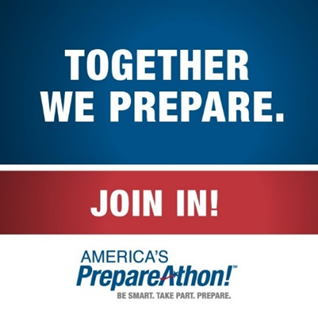 For ideas on other activities you can do for America’s PrepareAthon! and to register your participation, visit the website at ready.gov/prepare. Completed applications for Department of Homeland Security (DHS) preparedness grant programs must be submitted no later than 11:59 PM EDT on April 25, 2016. The grant programs provide funding to state, local, tribal and territorial governments, as well as transportation authorities, nonprofit organizations, and the private sector, to improve the nation’s readiness in preventing, protecting against, responding to, recovering from and mitigating terrorist attacks, major disasters and other emergencies. The grants reflect the Department’s focus on implementation of an all-of-nation, whole-community approach to the building, sustainment, and delivery of those core capabilities essential to achieving a secure and resilient nation. Eligible applicants must apply for funding through the Grants.gov portal, accessible on the Internet at http://www.grants.gov. Further information on DHS’s preparedness grant programs is available at http://www.fema.gov/preparedness-non-disaster-grants.